A reworked expression of Jack Daniel's n°7, Gold n°27 is a luxury version of the famous Tennesse whiskey, with a very slick finish. Gold n°27 is a delicately reworked version of Jack Daniel's n°7, crafted by Master Distiller Jeff Arnett. The filtration and maturation process of Gold n°27 make it a luxury version of the famous American whiskey. 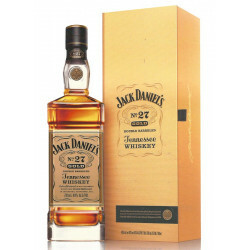 Gold n°27 has been double-filtered through maple wood charcoal, and matured in American white oak and maple wood casks. This expression is a must of great finess and unparalleled roundness.